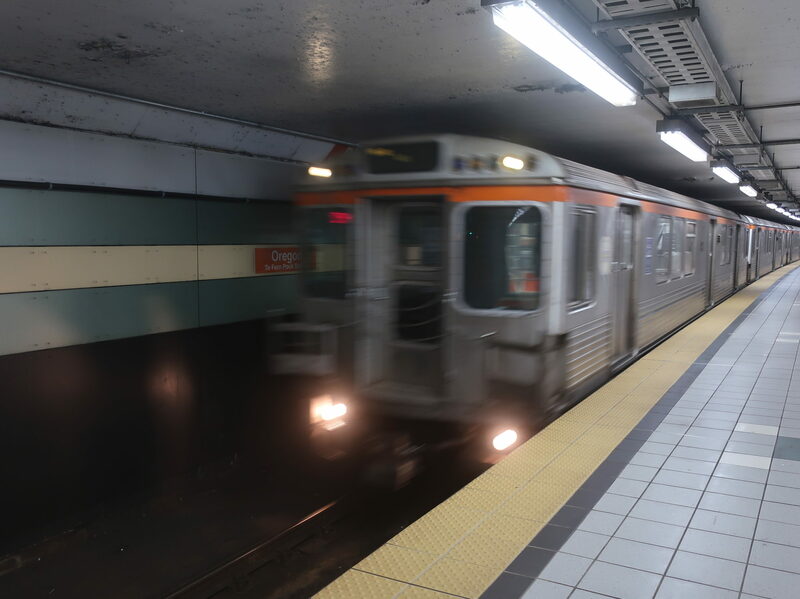 Wow, it looks like our first Broad Street Line post is actually taking us to another state! I knew SEPTA went to New Jersey and Delaware, but Oregon is quite a trip! What? It’s just in South Philadelphia? Oh, okay…not nearly as exciting, but South Philly is cool, too. Looking down the center platform. This station was opened in 1973, huh? Yeah, I’m not surprised. I couldn’t help feeling like I was in some sort of Eastern Bloc state when I was down here. 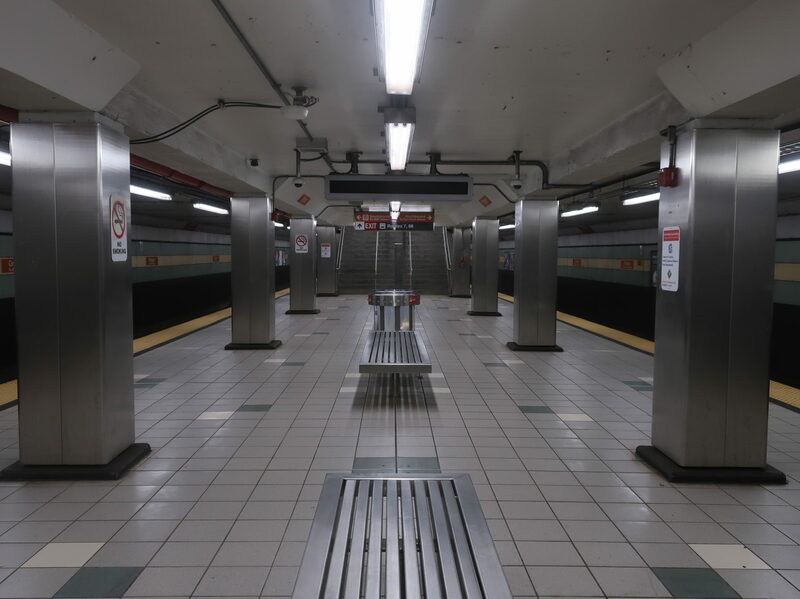 The platform is clean and all, but it’s very utilitarian in its design. Big metal pillars, simple colors, and exposed pipes are all hallmarks of Oregon. The station, not the state. Argh! Another hallmark of Oregon? 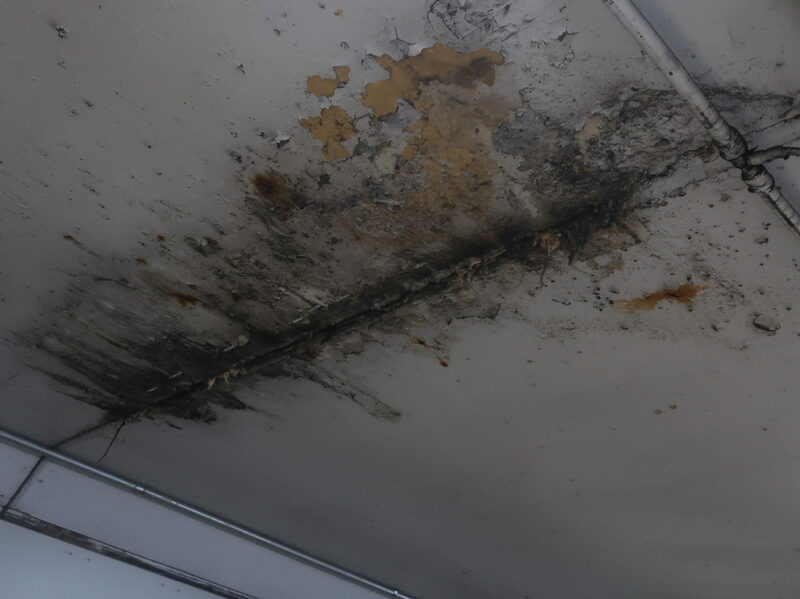 Excessive water damage, apparently! I sense a waste of space! The bus stop on the north side from across the street. The exit-only side does have the best of Oregon’s many bus stops. There are benches lined up under the building, so it ends up providing the most shelter of any of the stops here. This particular one serves the westbound routes 7 and G, as well as the southbound 68 (not that that route really has a consistent direction – it’ll be a fun one to review). Pro of Oregon: it’s accessible. Con of Oregon: the elevator is awful. I like that it’s glass (especially since it means you can see how slowwwwwwly you’re going), but the thing smells really bad. Also, what’s the deal with the buttons? For some reason, every button that you have to push has its metal covering withered away, so all that’s left is the gross stuff beneath the cover. This isn’t on any buttons that you don’t have to push, such as the door open and door close ones; it’s only for the ones that call the elevator, and the ones for each floor. Why??? That elevator takes you up to the main exit, as do a set of stairs and an upwards escalator. And…huh, more carpets up here. Okay? Well, anyway, although there are a million exit-only turnstiles here (as usual), this is not only the main exit, but also the main entrance. Yes, there are fare gates here! Let’s take a look at those. Oh, okay, I guess the faregates lead from outside into the building. I don’t think I’ve ever seen something like this in a subway station, but it works. 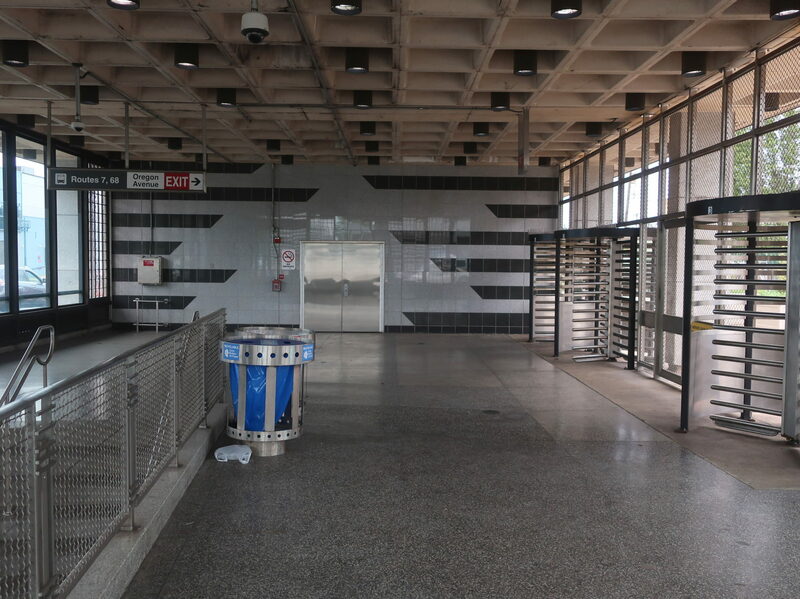 There’s a makeshift mezzanine on the plaza outside the station, complete with wastebaskets, a map, some nice plants, and about 20 bike racks stretching around the side of the building, contrary to SEPTA’s assertion that “no bike racks are at this station.” There’s just one problem: only one fare machine. Why only one? Is there not room for another? 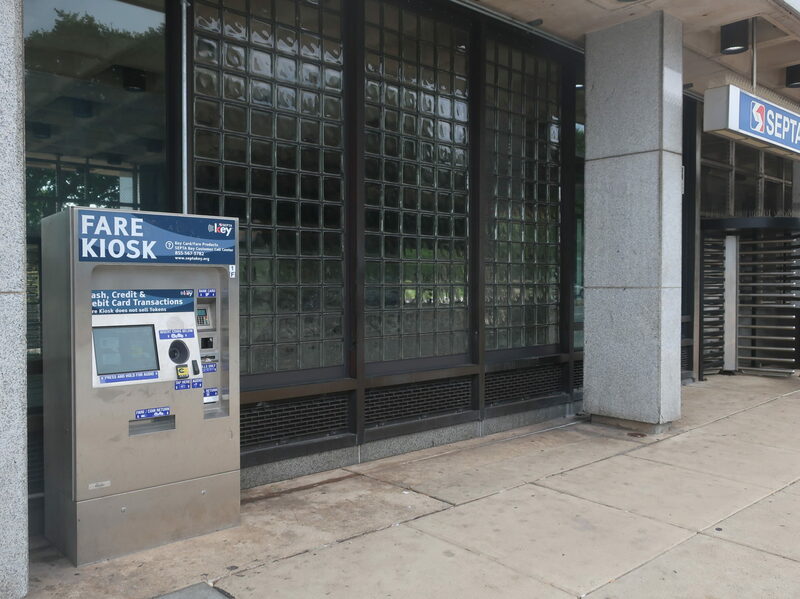 Oh…there is a second fare machine…on the other side of the building from the fare gates. Okay, why? Why put it here? Why have a random fare machine that’s completely isolated from the mezzanine? 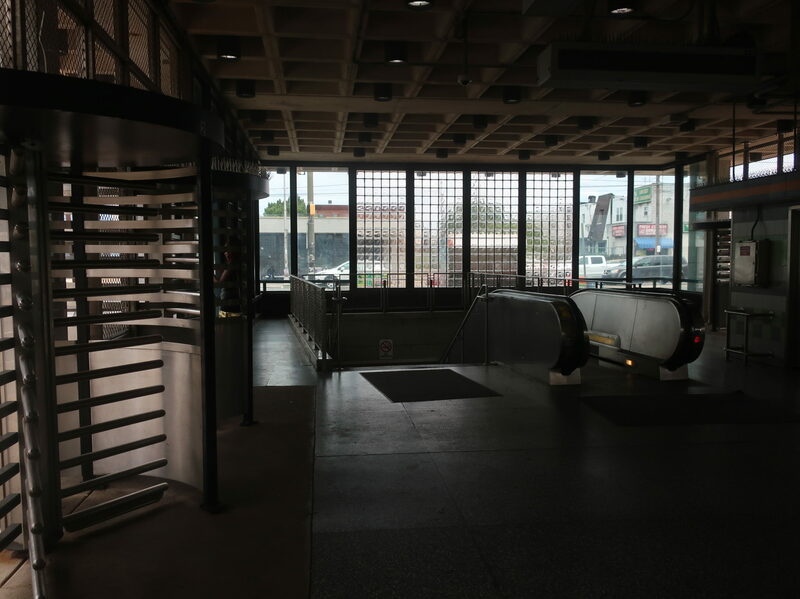 Sure, SEPTA could always replace the exit-only turnstiles with fare gates (which would be very nice) and make a second entrance here, but something tells me that’s not on their dance card. So…okay! Just one random fare machine. Sure. Another one of the station’s bus stops. The only other bus stop here worth dedicating time to is the one for the eastbound 7 and G, since it’s the only other one with a shelter. What other stops are there? 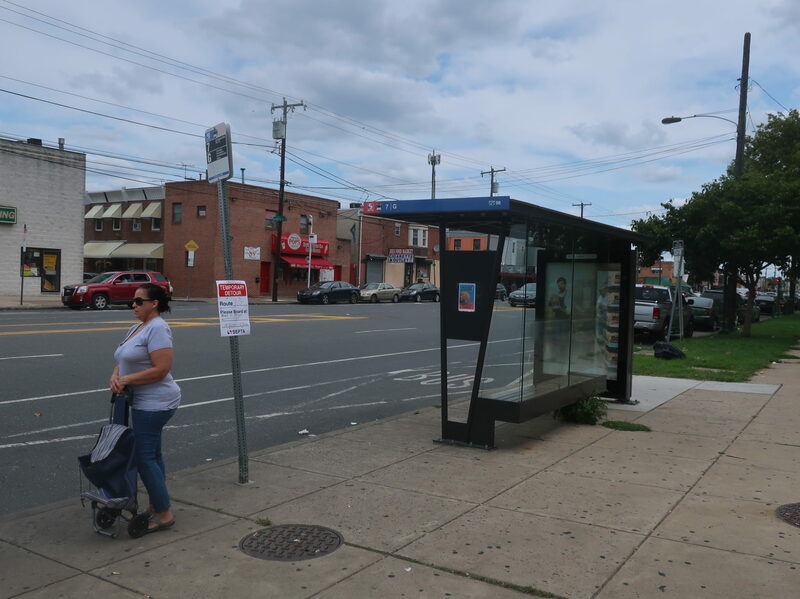 We’ve got one on the west side of the intersection of Oregon Ave, this one for the 68; a southbound one on Broad Street for the 4 and the Broad Street Owl; and two separate stops running north on Broad, one for the 4 and BSO, and one for the 45. All of those stops are just signs. And yes, it is confusing that there are so many. 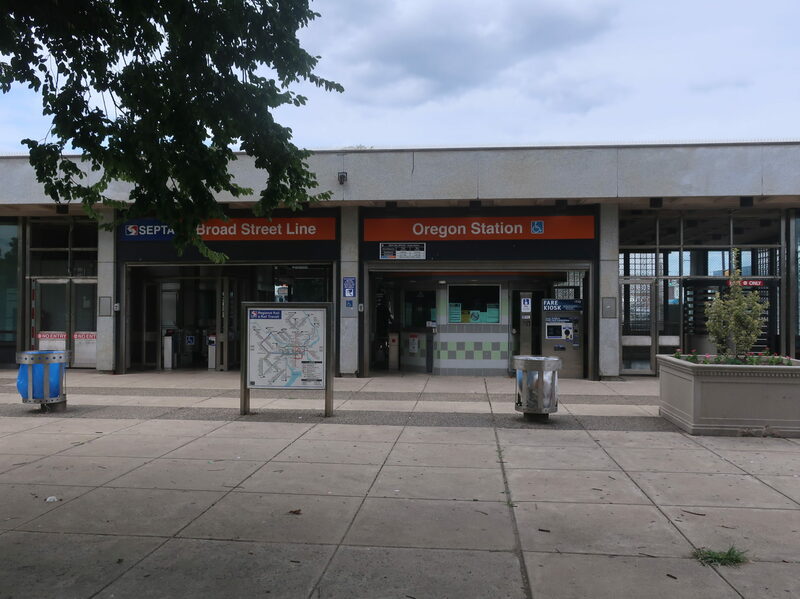 Ridership: Oregon’s ridership falls around the middle of the Sub’s South Philly stations (the Sub is the BSL’s alternate local name, since it’s almost entirely underground): the station gets 3,514 people per weekday. Aside from the many residents that probably use the station, I would imagine many of those people make bus connections, particularly to the 7 and the G, which together create a pretty frequent route down Oregon. Pros: Once you find the right entrance, this is a very straightforward station. It’s super easy to navigate, especially when you factor in the fantastic signage within, and the whole thing is clean. 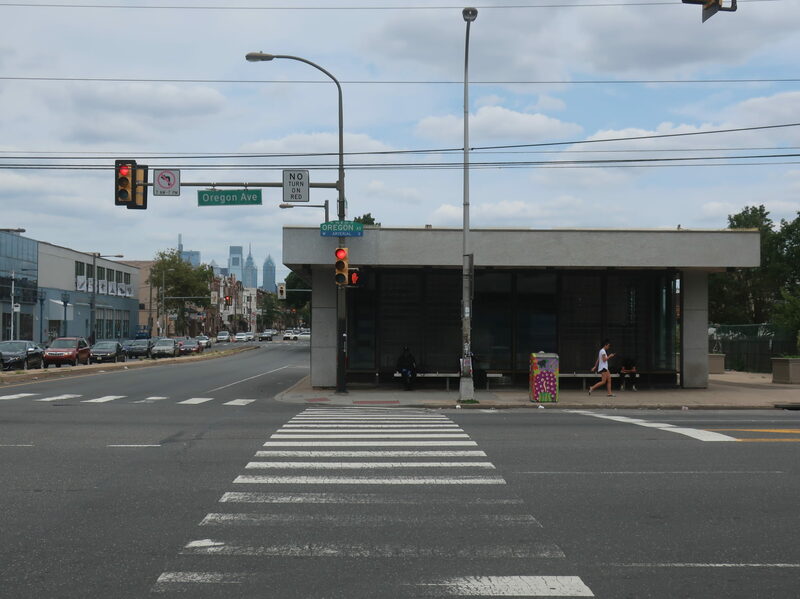 This is also a big bus hub with five regular routes (the 4, 7, 45, 68, and G, plus the Broad Street Owl at night), which is a ton for a South Philly station. Cons: Gosh…I’m so entranced by the awful fare machine layout that I can’t think of Oregon’s other cons! Oh wait, I remember now. First of all, the bus stops are really complicated, and although the signage within the station is great, it disappears once you leave. Some sort of map of the stops around the intersection would be a big help with navigation. Also, there’s the fact that the headhouse on the north side of Oregon is exit-only, even though there’s plenty of room to make it an entrance – no further explanation needed there. 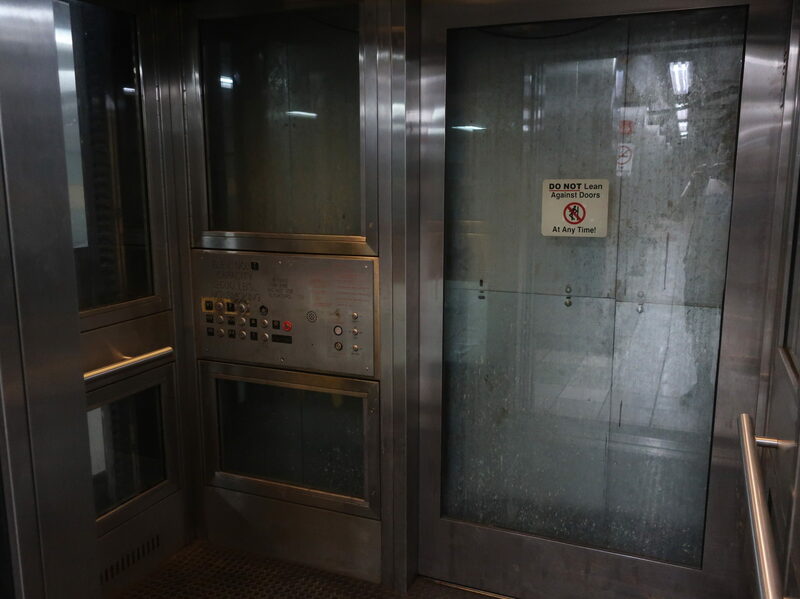 To round it off, there’s the bad elevator and the generally dismal aesthetics of the platform. Nearby and Noteworthy: Marconi Plaza is a big ol’ park with a playground, baseball fields, and lots of paths and benches – fun for the whole family! The station is right on the north side of the park. Also, I’ve been told that Pop’s has among the best water ice in Philadelphia, so give that a shot. It’s right near the station on the north side of Oregon Ave.
Oregon’s layout really blew me away in its stupidity. I mean, the exit-only headhouse? The one random fare machine? Who designs a station like this?? It’s at least straightforward and wheelchair accessible, but come on, this place isn’t worth more than a 5. Heck, even the straightforward thing only applies if you’re catching a train – it all falls apart if you’re trying to get a bus!